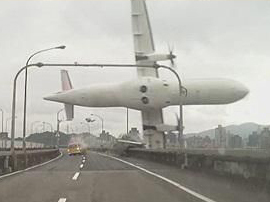 TAIPEI, Taiwan -- One of the two engines on TransAsia Airways Flight 235 went idle 37 seconds after takeoff, and the pilots apparently shut off the other before making a futile attempt to restart it, Taiwan's top aviation safety official said Friday. It was unclear why the second engine was shut down, since the plane was capable of flying with one engine. Taiwan's official China News Agency said investigators were looking into the possibility of "professional error." There would be no reason to have shut down the good engine, experts said. "It's a mistake," said John M. Cox, a former US Airways pilot and now head of a safety-consulting company. "There are procedures that pilots go through - safeguards - when you're going to shut down an engine, particularly close to the ground. Why that didn't occur here, I don't know." Multi-engine planes, whether jets or turboprops like the ATR, are designed to fly on one engine. When an engine quits, one technique that pilots often use, Cox said, is to identify and tell each other which engine is still running, then for one of them to place a hand behind the throttle controlling that good engine - guarding against an accidental shutdown. Cox said it is too early to draw certain conclusions but it's likely that the crew's failure to control the plane and shutting down the operating engine "will be part of the causal factors to this accident." The details on the engines were presented at a news conference in Taipei by Aviation Safety Council Executive Director Thomas Wang as preliminary findings from the flight data recorder. Several Internet aviation sites, including Flightradar24, questioned whether the pilots may have mistakenly turned off the wrong engine in an attempt to restart the idled one. Anthony Brickhouse, a safety-science professor at Embry-Riddle Aeronautical University, said investigators won't really know what happened to the engines until they do a "tear-down" and actually examine them - not just rely entirely on information from the flight-data recorder - to determine whether one or both were still producing power. TransAsia said in a statement that all 71 of its ATR pilots would retake proficiency examinations as requested by the Civil Aeronautics Administration. The pilot had 4,900 hours of flying experience, said Lin Chih-ming of the Civil Aeronautics Administration. "When it came to when it was clear his life would end, (the pilot) meticulously grasped the flight operating system and in the final moments he still wanted to control the plane to avoid harming residents in the housing communities," Wu said. Divers with a local fire agency found one female and three male bodies Friday along the muddy Keelung River bottom about 50 yards from the crash site, a Taipei City Fire Department official surnamed Chen said. Wang said the engines had shown no problems before the flight and repeatedly stated that the plane would have been able to take off and fly even with only one engine working. Evidence that the TransAsia pilots may have shut down the wrong engine drew comparisons with the 1989 crash of a British Midland Airways Boeing 737 jet shortly after takeoff from London's Heathrow Airport. In that accident, a fan blade failure in the left engine led to vibrations and smoke and fumes in the cockpit. The pilots believed that the right engine had failed and reduced power to it, which caused the vibrations to stop, convincing the crew that they had identified the troubled engine. As the pilots tried to make an emergency landing, the left engine quit, and attempts to restart the right engine failed. The plane crashed a half-mile short of the runway, killing 47 people; 79 survived.